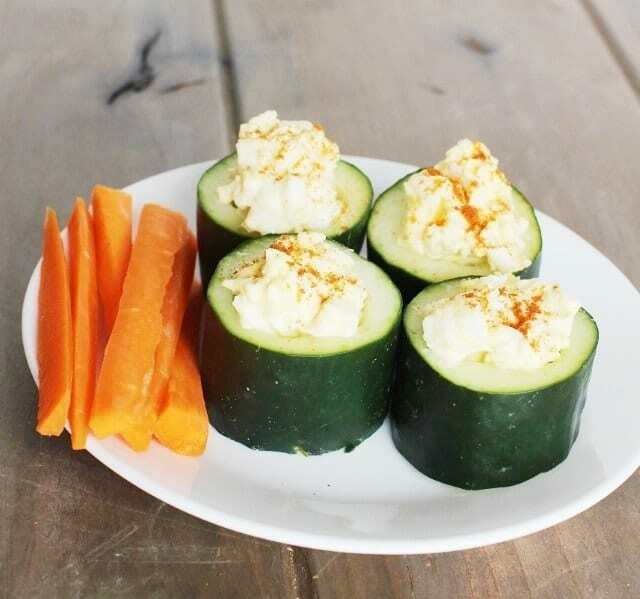 Loaded cucumber cups are a refreshing snack with a savory filling that will keep your kids full until their next meal! Why Are Cucumbers So Healthy? Cucumbers are 95.2 percent water and so they are a really hydrating food to eat for kids especially when it is hot! Cucumbers contain an anti-inflammatory substance called fisetin which has recently been suggested that it plays an important role in brain health. Can help prevent constipation. Cucumbers are rich in water, and their skin contains insoluble fiber. Both water and fiber help food to move through the digestive tract quicker and more easily, helping prevent constipation. 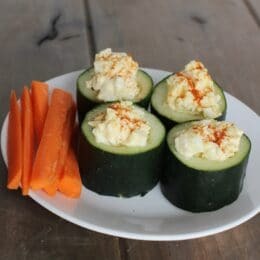 How to Make Cucumber Cups? 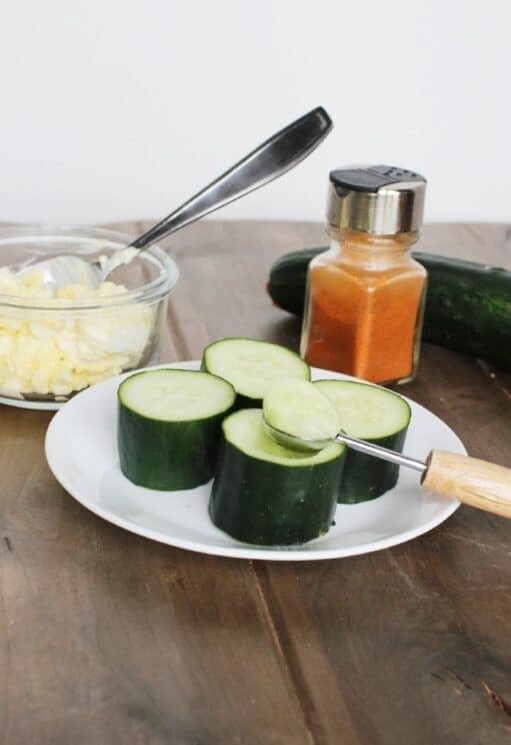 Slice your cucumber into even sections or ‘cups’. You want them to be about 1-1/2 inches long. Take a melon baller and scoop out the center of the cucumbers, enough to be filled. Mash eggs with mayonnaise, mustard, salt, pepper and paprika. Then fill the cucumbers up with the delicious filling! You will want to serve them pretty soon after you make them. The cucumber will lose its moisture and not be as crisp if you wait too long. 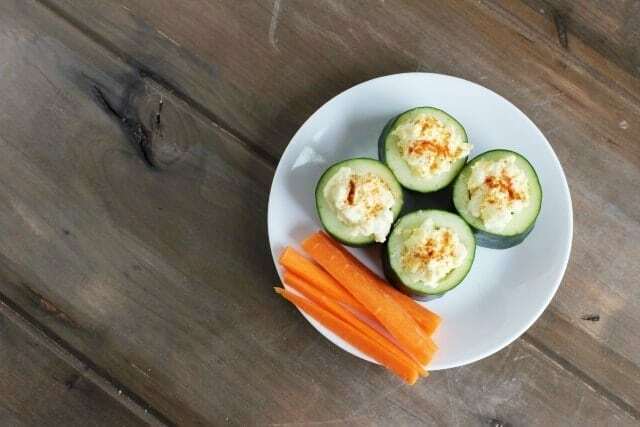 This snack combines the nutrition from the cucumbers with the protein and substance of boiled eggs. Each egg contains 6 grams of protein which is awesome for growing kids. Protein does so much more than just give you ‘strong muscles’. Protein is an important component of every cell in the body. Hair and nails are mostly made of protein. You also use protein to make enzymes, hormones, and other body chemicals. Studies show that protein is by far the most filling macronutrient. It helps you feel fuller longer which is great for kids. Place eggs in a small pot and cover with water. Heat over high. Once boiling, turn off heat and allow eggs to sit for 10 minutes. Rinse in cold water, peel and place in a bowl to cool. Meanwhile, cut cucumber into 1 1/2 inch thick pieces, removing the ends so that all pieces are able to sit on a flat surface. Using a melon baller or small spoon, scoop out the center of the cucumbers, enough to be filled. Mash eggs with mayonnaise, mustard, salt, pepper and paprika. 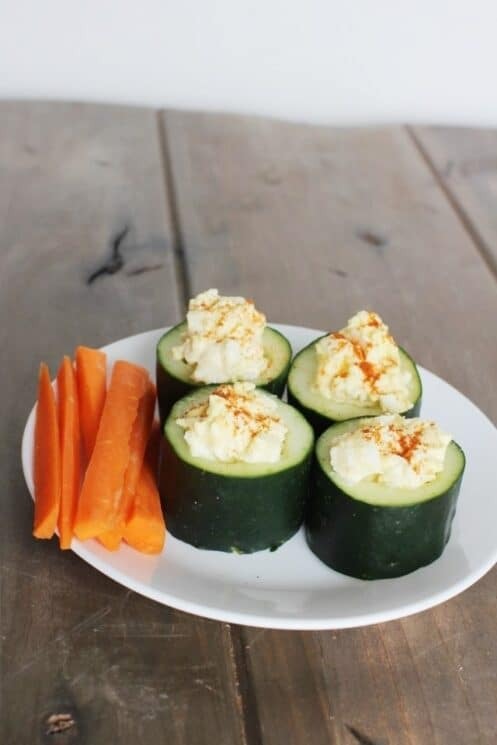 Fill cucumber cups with egg salad. Peel and cut carrot into small sticks. 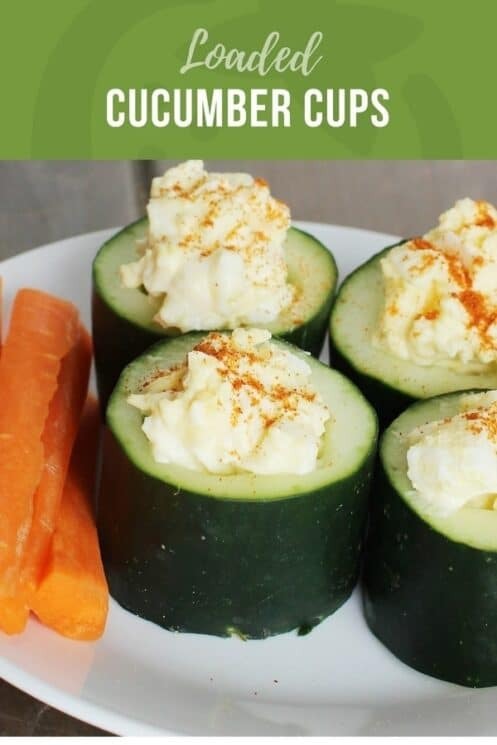 Serve with cucumber cups. Love this idea. Very novel way to make healthy foods fun! Fantastic idea. I’ve just became a huge cucumber fan recently, this idea was timed perfectly.